Enjoy the perfect blend of character and modern convenience in this 2 bedroom, 2-bathroom apartment loft located in downtown Victoria's Chinatown District. Within blocks of The Parliament Buildings, The Inner Harbour, The Royal BC Museum, The Empress Hotel & more! 1 secure underground parking stall is included. Featuring an open concept floor plan, 19 ft. high ceilings and a west-facing wall of windows, your living space is bright and spacious. Here you will find upscale furnishings including a retro-chic leather sofa, a modern lounge chair, a glass coffee table and a swivel-mounted, smart TV for your entertainment. 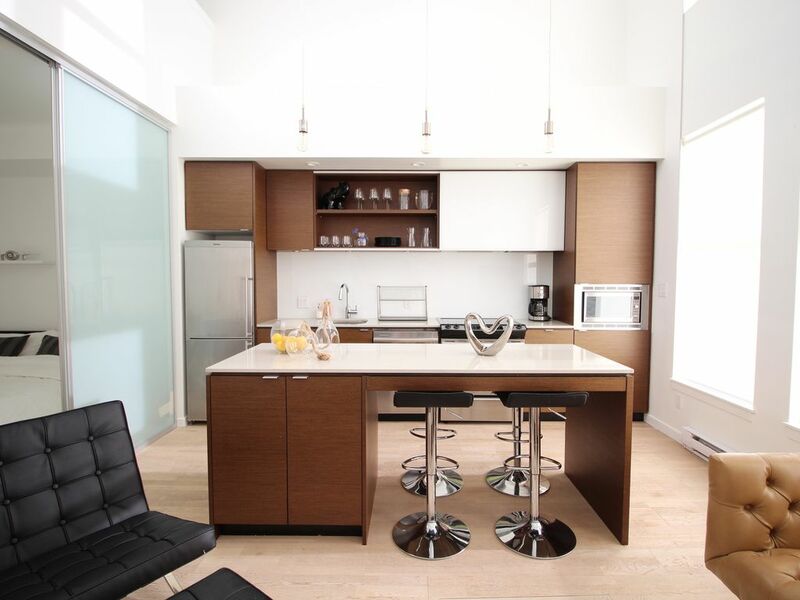 The kitchen is sleek and modern with a unique wood and high gloss design. Offering you top of the range appliances and all your kitchen essentials including a microwave, kettle, toaster, smoothie blender, pots and pans, a coffee-maker (regular drip type) and loads of dishes, plus complimentary coffee & tea. Head on up to the second level where you will find the elegant and spacious loft-style master suite. On this level you will also find your own private deck overlooking the common area zen gardens. Outfitted with patio furniture and a freestanding gas heater, this deck is ideal for cozying up and enjoying a drink all year round! BEDROOMS - Each of the bedrooms offer plenty of relaxing space and feature large, comfortable beds, black-out curtains in addition to ample space for your belongings in the custom closets. BATHROOMS - The bathrooms are contemporary and calming featuring a luxurious soaker tub besides the ground level bedroom and a walk-in shower in the loft-style master suite. EXTRA GUESTS - For extra guests, an additional twin-size airbed is available which comes with a built-in electric pump for easy use. All in all a party of up to 4 can be accommodated. The condo comes with high speed wireless internet, cable, smart TV, linens and towels, hair dryer, iron/ironing board and a personal laundry for your convenience. THE NEIGHBORHOOD - The apartment has a walk score of 99% which shows you how central we are. Unique shops and restaurants make this a great place to gather with friends & family or take care of business meetings. The Upper Harbour is only two blocks down the street and the Inner Harbour, The Parliament Buildings, The Empress Hotel and The Royal Museum are just a 10-minute stroll away. If you have any questions or would like any recommendations, I am more than happy to help! Hi there, I'm Dan! I love travelling to new cities/countries, and meeting new people. Travelling to different places has made me appreciate the importance of a welcoming host or helpful locals! I am eager to return the favor, and make your time in Victoria all the more enjoyable! Feel free to contact me with any questions about my listing anytime. Happy and safe travels! Perfect location, comfortable property, a definite gem! We stayed in the Victoria area for 5 days and wanted a place where we could walk to everything in the harbor area. This property was absolutely perfect, being just one block from Chinatown and a short 10 minute walk from the Empress Hotel and the general harbor activities. The host was extremely gracious, providing the essentials in the unit and went out of his way to provide us with a list of local favorites to visit. Another HUGE plus is it's proximity to the incredible Jam restaurant which is literally 1/2 block away. The beds were very comfortable, linens and bathrooms clean and well furnished, the decor was tastefully done and our overall experience was exceptional. A definite 5-Star recommendation when visiting the Victoria area. We will definitely reach out to Dan when we visit next year! We were a family group of 4 spending a week in Victoria and this property was a genuine home away from home. The location is great, the standard of furnishings and equipment superb and Dan was a perfect host giving us lots of information on local activities and amenities. We would completely recommend Dan's property and will be back ourselves to enjoy it again, thanks Dan. Beautiful place and great location! Beautiful place located downtown that was close to everything. Very accommodating with checkout. Great location, comfortable and chic! The apartment is on the edge of Chinatown and we walked to everything in Victoria. The place was very European, very clean, and comfortable for a family with two teen girls. The kitchen had everything we needed. Two baths was ideal, the washer/dryer was very useful, and the patio was a definite plus! We loved the city and we enjoyed experiencing it living in an apartment instead of a hotel. Thank you for a great stay!